September 20 – October 2, 2019 Fly home October 2. Our popular textile and cuisine tour is back! Arrive on September 20; fly home on October 2 – 12 nights. 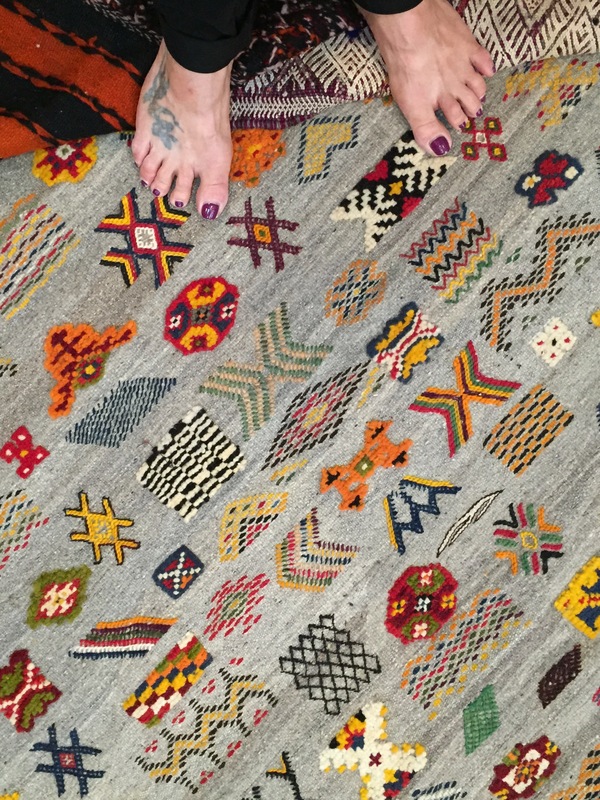 Highlights: This custom-designed textile and cuisine tour to amazing and exotic Morocco emphasizes not only the weaving and the food, but also the ceramics, architecture, and archeology. You’ll meet many charming and friendly local artisans and craftspeople, happy to show you the best of their country. Travelers are very welcome here; no visa is necessary for most visitors! Morocco is an exciting and exotic country; remote kasbahs of striking architectural design contrast with the bustling cities of Casablanca and the chaotic medina of Marrakech. Our small group will marvel at FIVE stunning UNESCO World Heritage sites. We’ll go behind-the-scenes to experience traditional Moroccan hospitality! And we’ll meet Berber women who are excellent rug weavers and button-makers, and men who are leather dyers, felt makers and ceramic artists. Charming little hotels called riads will be our home bases, except for that night in a Berber tent on the sand dunes! 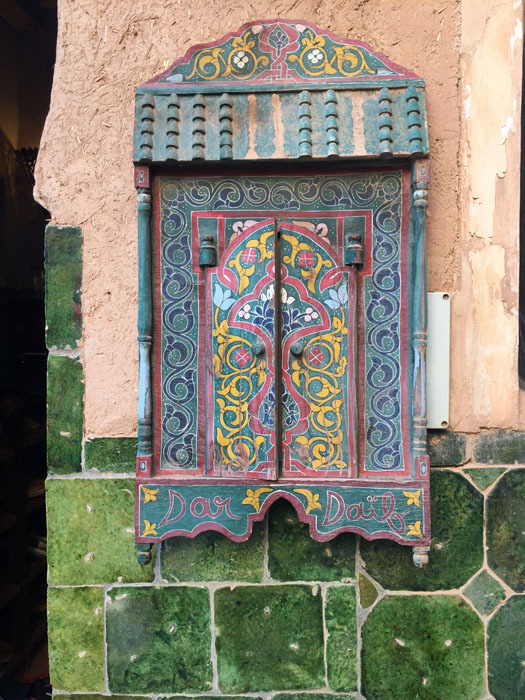 In each town we visit, we’ll explore the historic walled medinas, watch craftsmen at work, and poke around in the traditional little souks for spices and other treasures to take home. Everywhere we go, our delightful guide will show us the hidden corners to visit and the most interesting people to meet. We’ll start our textile and cuisine tour by flying in to legendary Casablanca. You will be met by Cynthia and the guide, or an official tour driver at the Mohammed V International Airport (CMN) upon arrival anytime (preferably morning) on September 20. Then we’ll check in to our hotel, have lunch if the timing is right, then relax at the hotel, or wander in the neighborhood. Next day we’ll go inside the fabulous Hasan II mosque with a special guide, at seaside Casablanca. Then we’ll drive south to marvelous Marrakech. In Neolithic times, the region was primarily agricultural, and it wasn’t until 1062 that the town of Marrakech was founded. The red walls of the city, built in 1122–1123, and various buildings constructed in reddish sandstone during this period, have given the city the nickname of the “Pink City. Marrakesh grew rapidly and established itself as a cultural, religious, and trading center. Today the popular city has modern businesses on the outskirts, but still manages to feel exotic and other-worldly, especially in the old fortified city area, called the medina. Here we will meet master artisans at work as we wander through the little stalls or souks. In Marrakech’s medina, we will stay in a beautiful and comfortable riad, as always decorated with traditional Moroccan furniture, rugs and accessories. The medina is a densely packed, walled medieval city with labyrinthine alleys. The little market shops offer a treasure of traditional textiles, baskets, felted slippers, pottery and jewelry. A countryside setting will be the venue for our entertaining cooking class. We’ll create a gourmet lunch of a homemade bread, tajine, a succulent stew, and a couple of salads. Our culinary creations, seasoned to our personal taste, will be our delicious lunch. 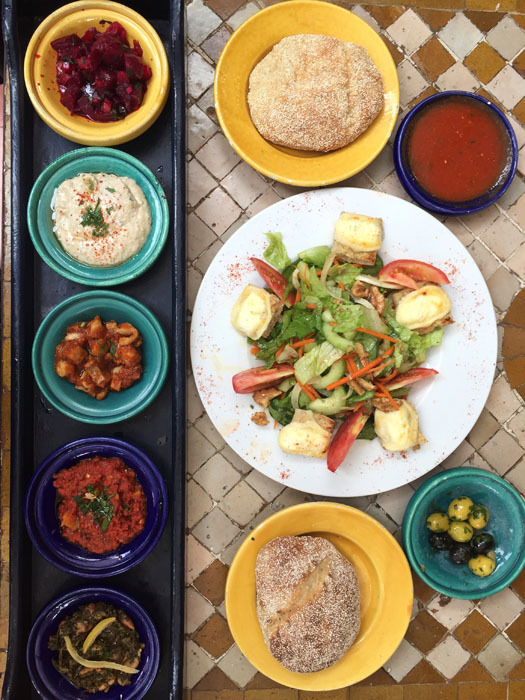 At some point we’ll visit the food and spice market to find specific ingredients necessary for the unusual flavor combinations that are now familiar to you in Moroccan cuisine. You can pick up some spices in a souk for foodie friends too. We will also see the Majorelle Gardens begun by French painter Jacques Majorelle, and the Berber Museum. We’ll visit the bustling open-air square called Place Djemaa el Fna where snake charmers vie for space between tiny barbeque grills and water sellers. Declared a UNESCO World Heritage site in 2001, the central square of Marrakech is chaotic and thrilling at the same time. Shopping is good here too! Next we leave Marrakech and drive over the Atlas Mountains to Ouarzazate, seeing the mystical ‘mud castle’ at Ait Ben Haddou. A striking example of the architecture of southern Morocco, the spectacular ksar or fortified city of Ait Ben-Haddou makes a perfect stop along the way. This group of earthen buildings surrounded by high walls has been declared a UNESCO World Heritage site. The earthen castle effect and the decorative motifs sculpted into the reddish adobe walls make Ait Ben Haddou an aesthetic wonder. In Ouarzazate we can go through the Museum of the Cinema; dozens of ‘swords and sandals’ films have been made in this desert area. The most famous is certainly Ben Hur, but Cleopatra, Gladiator, and Lawrence of Arabia were also filmed here. 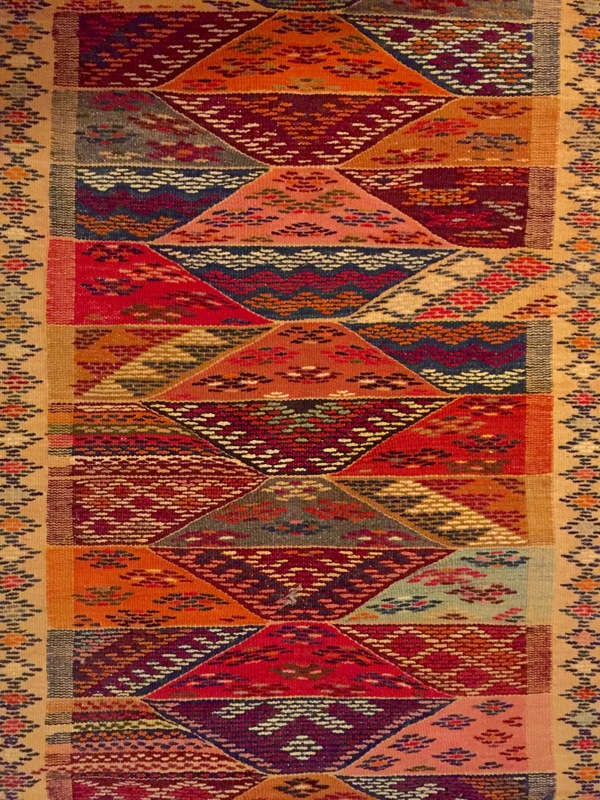 And along the way, we’ll check out the glowing handmade carpets in a favorite shop, and meet some Berber weavers who will show us their techniques. We continue into the arid and spectacular eastern region. In the mid-afternoon, we’ll go by 4-wheel drive across the stark landscape to the golden-orange Saharan sand dunes of Erg Chebbi. 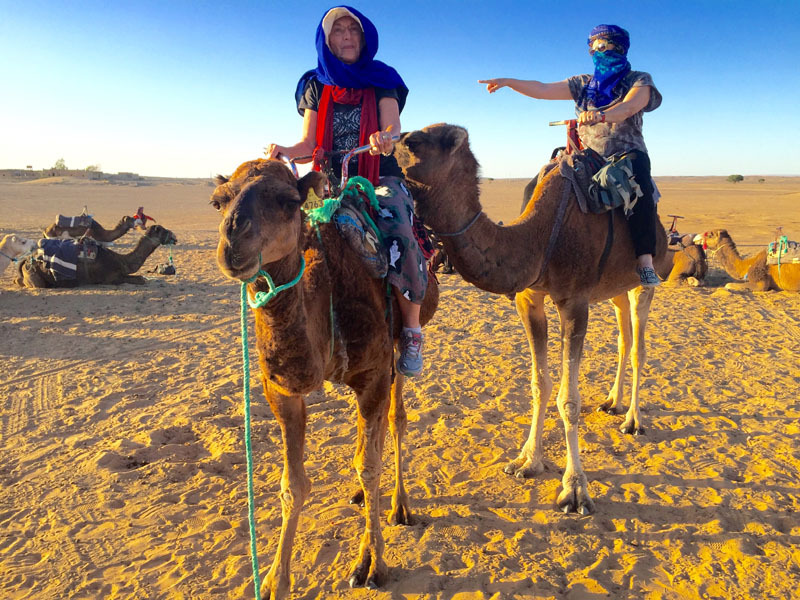 Then we’ll climb aboard camels for the short trek into the dunes to watch the sunset. We’ll have a traditional couscous dinner and fall asleep in comfy Berber tents under the stars. After breakfast next day, we head back in the Jeeps and then we’ll begin our drive through the Middle Atlas Mountains. Most of the day will be spent traversing beautiful forests, dramatic rock formations, and little villages on the route north to Fes, another UNESCO World Heritage site. As always there will be stops for photos and bathroom breaks whenever desired. Half way along this drive to Fes, we will stop in the town of Midelt for lunch. The town is famous for its minerals – geodes, trilobites and ammonite fossils and interesting crystals from the nearby mines at Mibladen. Beautiful mineral specimens are for sale in Midelt. Don’t you want to take home a few pounds of rocks?! 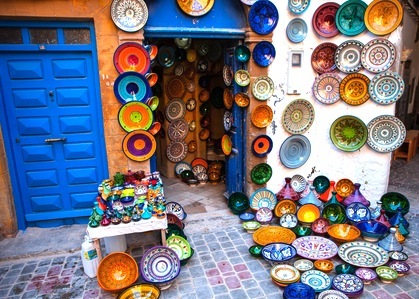 We’ll spend several days in Fes, sleeping in a charming riad in the old medina area. Wander here to find a carpet or a pair of earrings or a painted plate. Motorcycles are not allowed in Fes medina so we can relax here; shopping and visiting the mosques and madrasas is much easier than in Marrakech. Often referred to as the country’s cultural capital, Fes has over a million inhabitants, but it’s primarily known for its ancient sprawling, medina or ancient walled city, the best-preserved in the Arab world – and another UNESCO World Heritage site. Craftsmen still work and sell their products here, and the medina is divided into areas by trade—the leather crafters, dyers, ceramicists and so forth. Both the guide and driver live in Fes, and they’ll make you feel at home in this fascinating city. 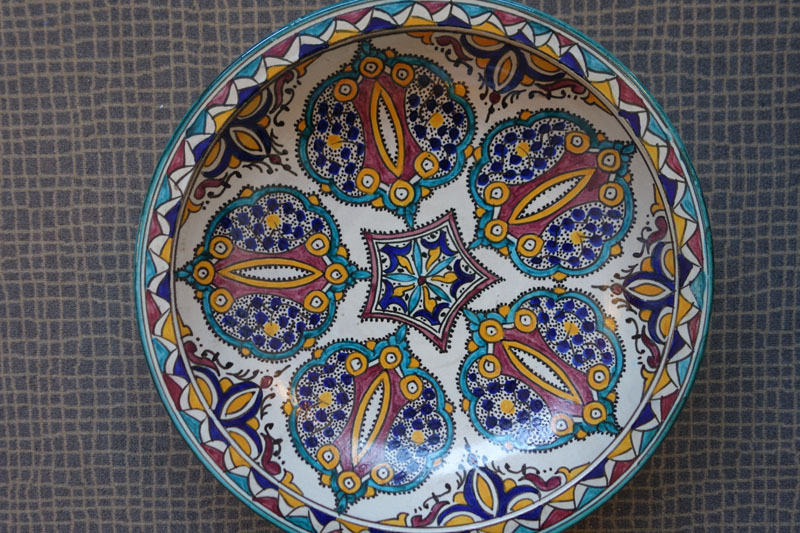 We’ll return to Fes for our for Farewell Dinner when we take leave of new and old friends, and pack our suitcases, ready for flights to Casablanca the next morning/day of October 2. October 1 is the last included night of hotel. After the trip, you’ll receive a photo journal book that will keep you dreaming of Morocco and your new friends! Tour Price: $3850 per person in a group of 9 -12 people; $4250 for 6 – 8 people in group. Note that there is a minimum number of travelers for a trip to ‘go’ and that varies by country. Please don’t buy air tickets until you are sure the trip will happen; email us to ask. Single Supplement: $ 800 To sign up, click here for instructions and forms. 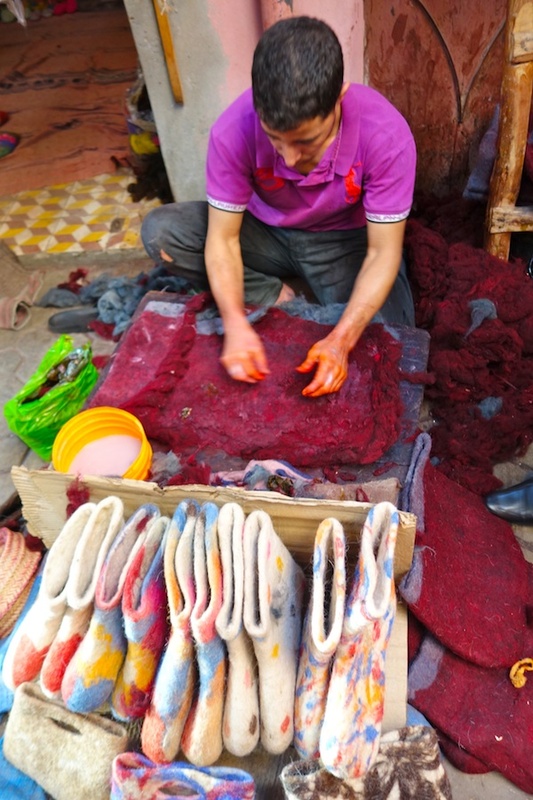 Felt maker uses sheep’s wool to make dark red felted purses, right. All ground transportation by private van with excellent, professional drive. Transportation to/from airport for arrival/departure. English-speaking, licensed, professional guide to accompany whole itinerary. French- and English-speaking textile expert Cynthia Samake also to accompany whole itinerary. Beautiful custom photo book, created and sent after you get home. Not included: Tips to guide and driver (we’ll suggest guidelines for this), personal items such as laundry; sites or activities not on the itinerary, between-meal snacks and bottled water when not in the van. *If you don’t want to do the cooking class, the lunch included during class time is on your own that day, since class participants will eat what they create. 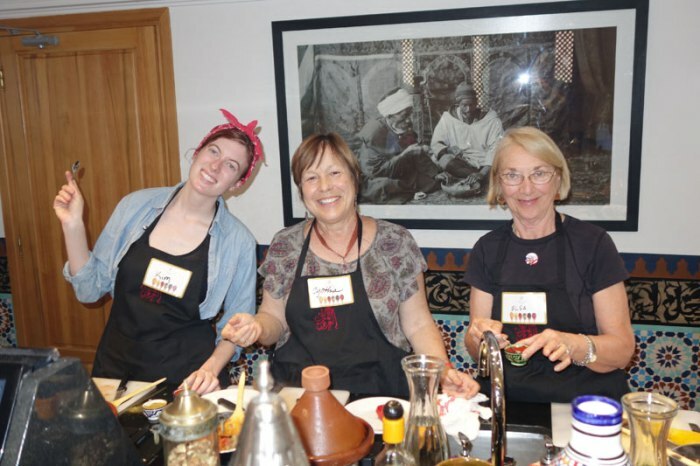 Cooking classes are lots of fun, but optional; we hope everyone will join in! Note that citizens of the USA, Australia, New Zealand, Great Britain, Canada, and many other countries do not need a visa to enter the Kingdom of Morocco and may stay up to 90 days. Email: [email protected] if you have any questions, or call 707-939-8874. To sign up, click here for instructions and forms.